All her life, nineteen-year-old Liesl has heard tales of the beautiful, mysterious Goblin King. He is the Lord of Mischief, the Ruler Underground, and the muse around which her music is composed. Yet, as Liesl helps shoulder the burden of running her family’s inn, her dreams of composition and childish fancies about the Goblin King must be set aside in favor of more practical concerns. But when her sister Käthe is taken by the goblins, Liesl journeys to their realm to rescue her sister and return her to the world above. The Goblin King agrees to let Käthe go—for a price. The life of a maiden must be given to the land, in accordance with the old laws. A life for a life, he says. Without sacrifice, nothing good can grow. Without death, there can be no rebirth. In exchange for her sister’s freedom, Liesl offers her hand in marriage to the Goblin King. He accepts. Down in the Underground, Liesl discovers that the Goblin King still inspires her—musically, physically, emotionally. Yet even as her talent blossoms, Liesl’s life is slowly fading away, the price she paid for becoming the Goblin King’s bride. As the two of them grow closer, they must learn just what it is they are each willing to sacrifice: her life, her music, or the end of the world. I think what sold me on this book most was the cover. I have no idea what it is but book covers have been beyond incredible for books coming out in 2017. For Wintersong, there was this sort of Beauty and the Beast look to it giving this haunting, yet beautiful feeling towards the overall exception of the story. We follow Lisel and the infamous Goblin King for the most part of the story but one should not have to overlook secondary characters such as Lisel's sister Käthe and brother Josef. Lisel has a song inside of her that is pure talent and there isn't much there that isn't overlooked. But when her sister is kidnapped by the Goblin King Lisel must sacrifice something besides her hand in marriage that means the world to her. What would you sacrifice for the person you love? I am glad I stumbled upon this book. Lisel is a character I could relate too, even though I am a guy but that is not in anyway the point. The idea of feeling wanted, of growing out of being a comparison, to finally have that shining moment is what we both wanted. However, we realize that although we may want to take the "glory" we are willing to give up our beloved possession for the people we love. Is that bad? Lisel has this naive sense buried under her feeling of being wanted that blossomed through the story. As she gives her hand in marriage to the Goblin King the idea of looking for acceptance becomes secondary to looking for the best in life. The Goblin King was a character that carried his own burdens. He carried his own misfortunes but most of all he carried the same wanting that Lisel did...having an identity. I am sad that this is a stand alone novel but also happy too. The novel ended well and I found myself content with a tear hanging in the corner of my eye waiting for release. Wintersong is a story with rawness that readers are constantly looking for. S. Jae Jones delivers a powerful debut novel that will take the reader on an adventure that will leave the reader bursting with emotion. 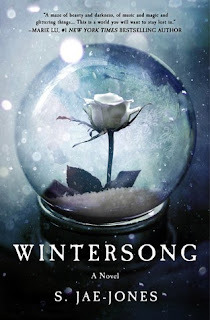 Wintersong is the book to grab. A haunting, thought provoking read on finding the real you and the sacrifices one takes to find it.